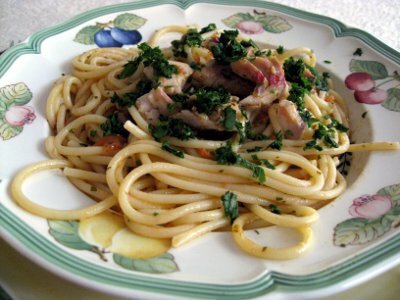 Spaghetti with Red Mullet Sauce. Today’s recipe really brings the flavor of the Mediterranean sea to the table. It is quite a while that I wanted to make a sauce for spaghetti with Red Mullets or Rougets (Triglie in Italian) and I am very satisfied with the result! Definitely a recipe to repeat! Any time I eat Triglie I think of my favorite Italian police inspector Salvo Montalbano, from the novels of Andrea Camilleri. He lives and works in Sicily, he is a foodie and Triglie are one of his favorite dishes. I bought the Red Mullets at Citarella and they cleaned it for me but did not fillet it, so I had to do it myself. I first cut the head and then split the fish in halves separating it from the central bones. I pulled one by one the bones that still were left in the fish meat. Fillet each mullet and cut it in 4 pieces. Heat about 2 Tbsp of extra virgin olive oil in a pan. Finely chop half of the the garlic and add it to the warm oil. When the garlic start to become golden add the fish and saute for a few seconds. Add some white whine and let it evaporate, but not completely. Finally add some “finocchietto” (wild fennel) and let cook one more minute. Then prepare a sauce “a crudo” with the tomatoes. Peel the tomatoes and chop them in small cubes. Finely chop a good amount of parsley and the other half of the garlic clove. If you like it also finely chop just a bit of red chili pepper. In a wok heat 2 Tbsp of extra virgin olive oil, add together the tomatoes, parsley, garlic and the chili pepper. All the ingredients are added at the same time, this is why it is called “a crudo”. Cook for a minute or two adding 1/2 tsp of sugar and salt. Then add the fish and let cook for one more minute. Cook the spaghetti al dente, drain them, and add them to the wok with the sauce. Let the flavors blend on high flame for just few seconds. Add some freshly chopped parsley and serve.